On the eve of arguably one of the most important events in any woman’s life, a bride forgot her wedding dress on a public bench at an airport. As far as Heidi Suletzki is concerned, the reasons why didn’t matter. What mattered was the garment bag left on a bench outside of “her” airport and that somewhere there was a bride to be who was about to be dressless on her big day. Suletzki can’t remember the first lost item she ever reunited with its frantic owner in her more than two decades of running the Bangor International Airport’s lost and found department. But she remembers that wedding dress. It’s times like that, Suletzki said, she becomes a bit of a detective. With years of aviation industry experience behind her, Suletzki — a former flight attendant for Lufthansa Airlines — knew that brides-to-be often stood out when boarding a plane. Eventually, Suletzki caught a break when a crew member she spoke with did remember someone talking an upcoming wedding. Using the clues provided by the crew, she was able to reference the passenger manifest and track down the dressless bride. Turned out, her big day was the next day — in Florida. It’s one of the realities of air travel. Sooner or later, every passenger leaves an airport or deboards a plane with fewer personal items than they started with. If they’re lucky, the lost items end up in an airport lost and found bin. If they are really lucky, the items find their way to the lost and found bin managed by Suletzki. Part detective, part customer service representative and all heart, for 40 years Suletzki has been the face and voice of BIA comforting and helping passengers who have not only lost things but those who have encountered disruptions in their travels through Bangor. Over the years she’s helped with security screenings, made sure law enforcement personnel were on hand to deal with unruly passengers, worked with travelers to determine what documentation is needed to travel out of the country and some of the other, more serious aspects of modern aviation transportation. In her office at the Bangor airport, Suletzki keeps the incident books — journals with hand written notes documenting airport staff and passenger contacts — chronicling years of encounters with travelers. “I look at the entries and it really surprises me how easily it looks when we handle things,” she said. “What you can’t see is all the underlying information on what could have happened. We’ve really seen it all over the years,” Suletzki said. And, of course, there are all those lost items to document and figure out. She’s lost count of the actual number of items that have come through her office, but she said each one is treated as the most important because to it’s likely frantic owner it is. Suletzki figures she has about a 50-50 track record of reuniting passengers and their lost belongings. Like the time a woman called asking about a doll her granddaughter had likely left at the airport. As more people have departed from Bangor for business trips or vacation — a record 500,000 passed through BIA last year — Suletzki said lost items have increased. Bathrooms seem to be a fertile ground for leaving things behind, as airport staff have found everything from prescription medications to jewelry to dental products in the men’s and ladies’ rooms. Books, watches, cell phones, keys, wallets, glasses, coats, gloves, toys, bags, shoes and even false teeth have all ended up in the airport’s lost and found bin. With thousands of United States military service men and women passing through the Bangor airport to and from duty stations overseas, lost military IDs are common, she said and many of those have ended up on her desk before being returned to a grateful member of the armed forces. Other times, her staff will track down owners of lost keys using information on a key ring. One time she tracked down the owner of a lost mouthguard thanks to the serial number and name of dentist stamped on it. As for the items that are left languishing at the airport? Every six weeks or so — depending on how much has accumulated — Suletzki and her staff document and clean out what is in her office and move it to a secure storage area in the airport. All items are held for six months, in accordance with Bangor city policy and at the end of that time, a decision is made on whether to donate the items to an appropriate non-profit or toss it out. No one grows up dreaming of the day they will be in charge of an airport lost and found department, and Suletzki laughed at that notion. But she did say working in aviation in some capacity is almost a foregone conclusion in her family. She grew up in Germany where her father was an administrator with Lufthansa and her sister was a flight attendant. In 1961 Suletzki became a flight attendant for Lufthansa Airline and soon found herself working on planes flying in and out of Bangor. The move to Bangor came in the mid-1970s when, after she had been a flight attendant for more than a decade, her husband got a job in aviation in Maine. 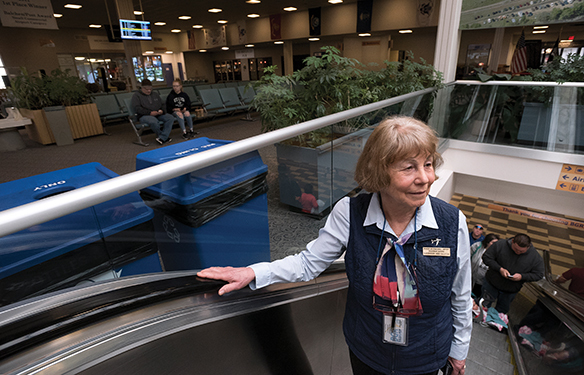 In 1979, Suletzki was hired to work with passenger services at the Bangor Airport, where she was tasked to help international passengers clearing customs as they entered the United States from Europe. Today planes are more than capable of carrying enough fuel to get from Europe to destinations beyond Bangor in the US, though the airport does remain a refueling stop for some air traffic. But 30 or 40 years ago, Suletzki and her staff had to be ready at a moment’s notice, day or night, to assist passengers from around the world. The 1970s ushered in a new era of airport security in the wake of numerous hijackings occurring globally, and by the time Suletzki was hired, a decision had been made that passenger services at the Bangor airport would assist in security screenings. “As far as technology to help in the screening, that was pretty limited 40 years ago,” Suletzki recalls. For support, local law enforcement would come in to oversee the security screening and Suletzki said the traveling public was not always happy about having a stranger go through their bags. After 9/11, there was a stark increase in security screening procedures and the addition of TSA — the federal Transportation Security Administration. Suletzki turns 75 in October but has no interest in slowing down. And for those passing through who maybe only realize at 30,000 feet when the seatbelt sign has gone off that something got left behind miles behind them back at Bangor? They can find comfort that Suletzki and her team of airport sleuths are on the job.